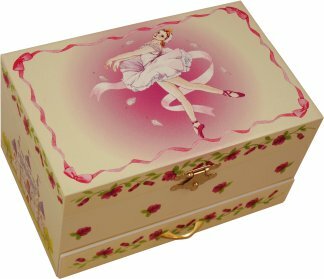 A larger musical jewellery box with pull out drawer perfect for girls to hide their special treasures. 'Annabelle' is finished in glittery cream & pink with roses & ballerina design. Open the music box to reveal the pink velvet interior with storage compartments for jewellery & watch the ballerina figure twirl as the music plays.